Going Grumpy: Why The New York Times Is Wrong About the British Election, and Maybe U.S. Politics As Well. “The suicide of Britain,” proclaims an apocalyptic and, (as the Brits would say) bloody silly headline on Ross Douthat’s op-ed column. Arriving back in New York after a very pleasant and refreshing visit to England, I’m surprised by the response to last week’s U.K. election in my gloomy, grumpy edition of The New York Times. C’mon guys. Lighten up a little. It could have been a lot worse. Conservative leader David Cameron’s surprising win gives Britain a better chance of stability than the outright muddle that was suggested by pre-election opinion polls. Thank goodness the pundits and data experts were wrong. The nation could have faced weeks of confusing bargaining over how to stitch together a shaky coalition. Reading The Times over the past few days, you get the impression that the crushing defeat of the socialist Labor party leader Ed Miliband means that Britain is going to the dogs. In his panicky “suicide of Britain” column, Douthat is wrong to suggest that “the United Kingdom as we know it is on the ropes.” A little over-the-top, Ross! The “little Englander” UKIP actually won fewer votes than many had expected. This anti-modernist protest movement will be represented by a solitary M.P. Douthat’s foreboding claim that “the deep winners were the forces of nationalism,” is an exaggeration. Yes, the Scottish Nationalists did score a stunning victory, winning 56 of the 59 seats they contested. But thanks to Cameron’s success in England (where the great majority of British people live), the SNP simply doesn’t have the votes in the 635 member Parliament to demand another at-bat for independence. Last year, the cause of Scottish separatism suffered a clear defeat. Cameron has ruled out another referendum in the next five years. Last week’s SNP election sweep was more about states’ rights than an overwhelming demand to break from the U.K. The system of government is highly centralized, and ruled from London. Scots, quite understandably, want more power over their own taxes and spending. The demand for federalism will not inevitably lead to a weaker United Kingdom. 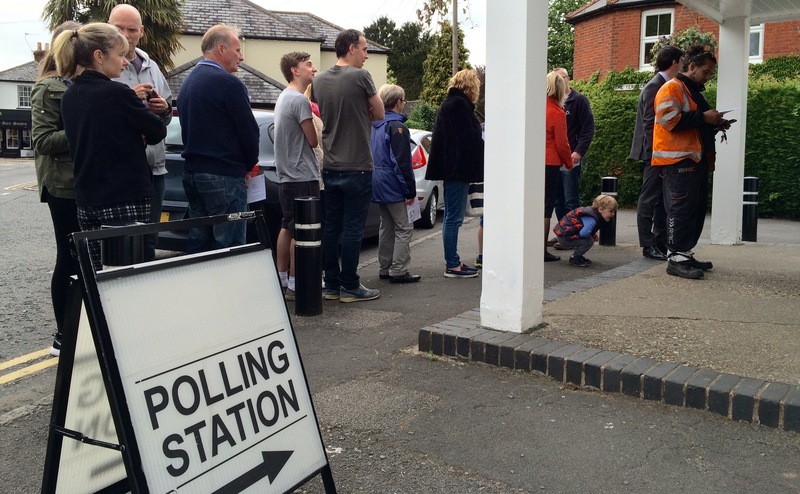 The line outside a polling station in Berkshire. U.K. turnout was the highest in 18 years. As for the European Union, Cameron’s pledge to hold a referendum by the end of 2017 on U.K. membership could actually strengthen rather than weaken the European cause. Maybe not. Antipathy to rules and regs from Brussels is nothing new. For decades, right-wing British conservatives have been deeply skeptical about being part of Europe. In the 90’s they caused misery for the Tory government of John Major. Holding a referendum at a time when when well over 50% of Brits say they support staying in the E.U. could settle the matter for many years to come. Britain is not alone in calling for a more decentralized Europe. “We have potential supporters, even among countries that have been reluctant to be associated with the curmudgeonly British,” says the Mayor of London, and Conservative M.P., Boris Johnson. Johnson may turn out to be wrong, and “Brexit” (Britain saying no to the E.U. ), might be in the cards. But both his argument, and the positive case for what happened last week in the election, is getting short shrift in The Times. The result of this election is more evidence that the left in both the U.S. and the U.K. has misunderstood the message sent by voters. Conservatives in both countries simply seem more cheerful than their opponents, regardless of the strength or weakness of their cause. By all means, The Times and others should champion the cause of minorities, low paid workers and the unemployed, who don’t get a fair shake from our system. But don’t ignore the contributions of entrepreneurs and wealth creators, and the aspirations of middle class taxpayers to better themselves. Many of us want to read about hope and progress, instead of merely being subjected to a steady diet of whining and foreboding. ← Women Are Winners in Britain’s Surprising Election. So is the UK Economy.